VANCOUVER, British Columbia, Sept. 10, 2018 (GLOBE NEWSWIRE) -- Otis Gold Corp. (“Otis” or the “Company”) (TSX-V: OOO) (OTC: OGLDF) is pleased to provide an update to its 2018 exploration program at the Kilgore Project, Clark County, Idaho. 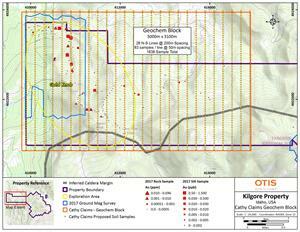 As part of the ongoing exploration plan, a soil sampling survey over the emerging Gold Knob and Cathy claim targets, a newly-discovered area located in the northwest portion of the Kilgore Project, is underway. Approximately 1,700 soil samples are to be collected over a 200 metre (m) x 50m spaced grid (see Gold Knob/Cathy Claims Geochem Block map). The geochemistry block will encompass areas that were covered by 2017 reconnaissance sampling and ground magnetic surveys. Reconnaissance stream, soil and rock sampling from 2017 and the ongoing 2018 program, have indicated geochemical anomalies associated with a number of silica and calcareous sinters, as well as silicified volcanic rocks. The goal will be to constrain the area of interest for future field and drilling campaigns in the Gold Knob and Cathy claim blocks. The soil sampling program may be extended based upon the results of reconnaissance geologic mapping and sampling programs. Additional exploration work planned for this fall includes a project-wide LiDAR (Light Detection & Ranging) and orthophoto survey to supplement existing geochemical and geophysical surveys and to assist in identifying structural controls of the location and host of potential mineralization. This will be supported by a project-wide effort to update the geologic map at Kilgore with a concentration on Dog Bone Ridge, Prospect Ridge, Mine Ridge (an area around existing Kilgore Deposit), Gold Ridge, Gold Knob and Cathy claim areas. Additionally, with new permits received, a 25-hole drill program totaling up to 7,500m of mixed RC and diamond core exploration and development drilling is in the planning stages. The planned drill program’s goal is to directly add ounces to the Kilgore Deposit via drill holes placed within and immediately adjacent to the deposit and via step-out drilling into outlying prospective target areas including Prospect Ridge to the south and northwards to what is known as Kilgore North. Further details of this drill program will be announced shortly. Exploration field work and the upcoming drill program will be coordinated from Otis’ new field office in the town of Dubois, Idaho. The new office will centralize Otis’ exploration office, core logging and core storage needs into one convenient location, significantly simplifying logistics and decreasing occupancy costs. Dubois is the county seat of Clark County, Idaho and is located approximately 27 miles from the Kilgore Project. As a result of this move, Otis will not be renewing its lease in Spokane, Washington. The qualified person under National Instrument (NI 43-101) Standards of Disclosure for this News Release is Alan Roberts, CPG, and Vice President of Exploration, who has reviewed and approved its technical content. The Kilgore Project lies on the north-eastern margin of the Miocene-Pliocene Kilgore Caldera complex in the Eastern Snake River Plain, Idaho. The Kilgore Project contains the Kilgore Deposit with a current NI 43-101 compliant resource: Indicated Resource of 825,000 ounces Au in 44.6 million tonnes at a grade of 0.58 g/t Au and an Inferred Resource of 136,000 ounces Au in 9.4 million tonnes at a grade of 0.45 g/t Au (the “Deposit”). The Kilgore Deposit is a low-sulphidation, gold bearing, quartz-adularia epithermal system hosted in Tertiary volcanic rocks, local Tertiary intrusive rocks, and basement Late Cretaceous, Aspen Formation sedimentary rocks.